When using this option to text via email, replies are sent to the email address From Email field. Enter the 10-digit phone number (found on the Individual Information tab of Person’s Detail page) and select the provider from the Person Detail page. You can now select the Send Text Message (SMS) icon from the Person Detail page of the grid results in a List, Group, Tag or Mission Trip. Now you are ready to enter your message in the SMS Message box. The counter shows how many characters have been entered. 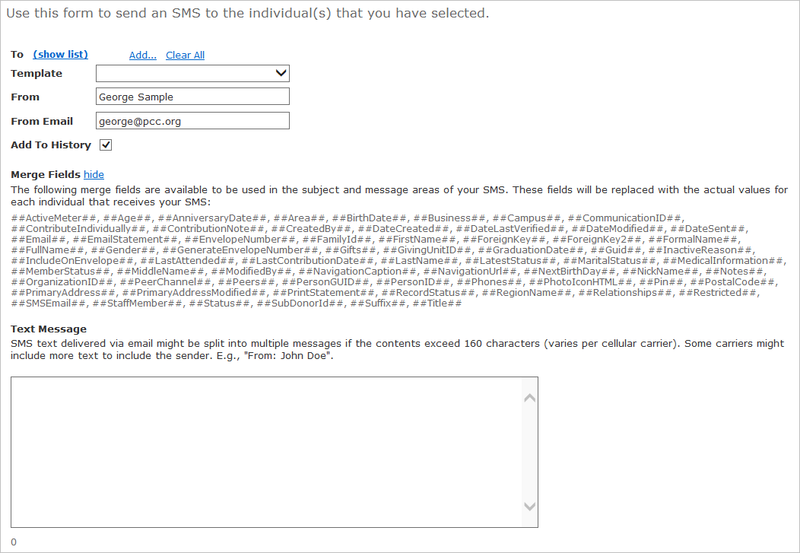 The number of characters are not limited due to some cell providers sending multiple texts if 160 characters are exceeded. From: Arena auto-populates the current user’s name. You can change this to any other person or department name. This field allows one entry. From Email: Arena auto-populates the current user’s email address. You can change this to any other email address. This field allows one email address. This email address displays as the sender for the recipient.